That fellow has seen some action. Ken Im headed there in Oct and preparing my rig. WOuld love to hear of any issues or just pointers you have for shooting both in the surface cages and the submerged cages. Great photos! I will be going there in October as well, and am also interested in any tips or pointers. Thanks! 1. GET LOW. Nobody cares about the top of the shark. The money is in the mouth and the eyes. Most of the diving is from surface cages, meaning the deepest you can get is 8-10 feet. I found kneeling in the cages worked the best for maximum stability and best angle. 2. Shoot on burst with continuous autofocus. It is all about the action with these sharks. A great shot is them going after the bait with their mouth open and if you wait to try to take a shot just at the perfect moment you will miss it. 3. Use single point AF (or small zone). There are a ton of smaller schooling fish that rush the bait when it is thrown. The sharks make them scatter and are often much closer to your camera than the shark is. You need to be able to punch through these fish, who act like backscatter to get to the shark. 4. Shoot with a high shutter speed. I shot at my maximum strobe sync speed. 1/250. I would have shot even faster if I could. 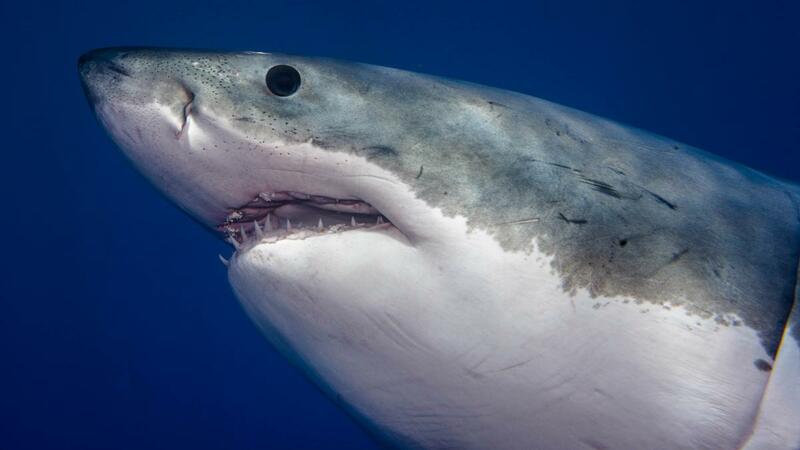 Sometimes the shark moves slowly, but often they are rushing the bait and thrashing about. Sometimes YOU are the one moving when the cage bounces around from the swell. Freeze that action! 5. Shoot with a relatively high F Stop. I shot most of my pics at F6.3. You want corner to corner sharpness in your dome since your goal is to fill the frame with the shark. That means the most interesting part with the finest detail (the teeth) will often be at the side of your frame. 6. Shoot with a medium zoom lens. Most of my shots, including head on shot everyone loves (https://www.drewwilson.photography/…/Great-White-…/i-QP8jWXf ) were shot with a 24-70mm equivalent lens. In fact the head on shot was a 70mm! The bait is thrown a good 10-15 feet in front of the cages. They pull the bait in, but most of the action occurs 10-15 feet away. Even a big great white will look quite small on a 16mm lens when they are 15 feet away. It is really nice to be able to change the zoom to track the shark as it moves about. I had started with a 14-28mm equivalent but was shooting everything at 28mm. The sharks don't always swim RIGHT in front of your cage. A little reach can be helpful. 7. Shoot at a relatively high ISO in order to target proper exposure. I had my ISO at 400-800 the whole time to make the exposure reading within a decent range of center. 8. Set your strobes to medium power so they cycle fast and can add fill lighting. The strobes are only really useful when your subject is within 5-10 feet. At 10 they will lose color, but help to get rid of some of the shadows and show the contrast between the top and bottom of the shark. I ordered a pair of inon z330 but they are backordered for a couple of months and I am going on that trip next week without strobes, is that a big problem?? you are close to surface and clear water, if I have no strobe what do you recommend to do? I was thinkin f8 1/400 iso 400. Also if video light can be usefull I can take one of those. Thank you! I am using a nikon d850 for the fist time, forgot to add that up! I was a canon dslr user before. I’ve been 9 times so far (10th and 11th trips upcoming over the next 2 months), so I’m basing my response on my experience at Guadalupe. You definitely don’t need strobes. In fact, during my first 9 trips (with multiple groups on different boats), I’ve only seen one person use their strobes. Ambient light is more than enough to get your shots. At most, strobes offer some fill light for the bottom of the sharks, but not necessary by any means. In fact, many times the sharks are about 10+ feet away, so strobes (or a video light) would be of limited benefit. Your settings are a good starting point. I usually shoot a little slower shutter speed (1/250) allowing me to drop my ISO down to 100-200. I shoot manual and adjust to light patterns with ISO first. Lots of good info I above wish I had when I went. Yes, strobes while nice when they came in close, but for me the sharks were not coming close frequently. Note that you have 2x different meterings areas, depending on the time of day and how the sharks are approaching....from below and from the side near the surface. In the am, it's a bit dark and I would have to bump up the ISO a bit. But later with more light at the surface, I could lower the ISO. In the PM, it varied depending on which side of the boat. The point is don't forget to change the ISO as the light/ positions change. For me, I used the Olympus 12-40 pro...as the sharks kept their distance. Only a few times they came RIGHT in close and I blinked..and that was it. Maybe it was an off week. Be careful in the cage, it you get bounced around and the bars in our cage were not padded. The camera Dome and cage bar..not a good thing. I found that post production white balance correction was a huge help. Ive never been a fan of Auto ISO but in this situation Im considering it. Any thoughts from you guys? I’ve never trusted it. However, I’ll be back at Guadalupe this time next week and will give it a test. Will report back how well it works. Thanks Mattwallace24 that would be awesome. I l head out Oct 15th. Look forward to your findings. Mattwallace24 I am also going next week, we might be on the same boat. Belle Amie? I’m on the Solmar V. Have a great trip and maybe see you out there. Just returned last night. Was not impressed with my camera’s (Nikon D500) auto iso, but that is to be expected. I’ve yet to see consistent photos using auto iso at Guadalupe. Much easier to take some quick test shots to set your iso. I also try to slightly underexpose my photos to prevent blowouts and edit the exposure later in Lightroom. Just returned last night. Was not impressed with my cameras (Nikon D500) auto iso, but that is to be expected. Ive yet to see consistent photos using auto iso at Guadalupe. Much easier to take some quick test shots to set your iso. I also try to slightly underexpose my photos to prevent blowouts and edit the exposure later in Lightroom. Good to know. Thanks for the follow up. Kind of a bummer tho. Would be nice not to have to make too many adjustments once below the surface. What iso did u find yourself shooting in mostly at the surface and at depth? I would take test shots of the bait...Trying to keep a low ISO as possible....200 to 400. I think I had to use 800 in the am. White balance correction in Lightroom works wonders (I did not have it on the trip). At depth, you have the sharks cruzing by slowly, sometimes close. With no strobes, you can correct in light-room. Ive not had a ton of time for edits but here are some of the images from my Oct trip on the Belle Amie. What a great trip! I dont repeat many trips but would do this one again in a heart beat. I mosly used my 18-70mm but could have used a 100mm at times in the submersible cages for aure. I tried my 10-24 in 1 dive and quickly decided that was too wide. Also put a vid together. Its 15min as I just couldnt kill anymore clips. The giant male hitting the cages on the 4th song was spectacular! Whoaw this is awesome. Nice shot.